We couldn't be happier to join such a wonderful Chamber of Commerce. You have really made us feel welcome. I really love my work with the Concord Chamber and working within the Capital Area Student Leadership (CASL) program. It's a great way to stay connected to area high schools students and to learn what they are dealing with. Working with all of these schools has been rewarding and challenging. Thank you for giving me the opportunity to speak directly to the CASL students and for your kind words. I really get a lot out of working with the CASL program. Again, thanks for thinking of the Boys & Girls Club for the Chamber event. We always love taking the opportunity to tell our story to a wider audience. The team at the Chamber is so easy to work with low stress and high energy. We at the Club were very happy with the attendance, flow of the evening. Great job all! As a business owner, building a strong referral network is essential. The chamber makes this task easy through their well attended events and member participation. Joining the chamber was one of the best business decisions I’ve ever made. Thank you for a great event the other night. I had a blast. You all do an amazing job! I want to say really briefly how impressed I have been with the Concord Chamber. The informational packets and thorough/hands-on service has been fantastic. It is easy to see that it is an organization that is run by passionate community members. I’ve never been to a chamber event before but even just attending the member briefing was really eye-opening and I am honestly looking forward to getting more involved on behalf of Davis and Towle but also, for my own personal benefit and enjoyment. As a Concord native – born and raised – it has definitely sparked my interest. Chamber Connections is a powerful resource for Chamber members. The format, which mixes member profile presentation about how their business adds value for their clients, each member’s “Teaching Time” to pass along knowledge based upon their personal expertise, plus presentations from invited experts makes for an extremely valuable 90 minutes. Additional networking time outside of the Connections meetings allows members to further build their brand and develop a whole new network of “Connections Ambassadors” to help grow relationships at larger Chamber events. I am so glad I was invited to participate. Worth every penny and minute. Since working for an organization that’s a member of the Greater Concord Chamber – I know the community on a whole other level. I don’t miss a Business After Hours event – they are great for networking and just having a good time – and the staff is always helpful, too. What a great way to launch Watercolor by Conrad Young and our membership in the Chamber of Commerce... Business BEFORE Hours at ConvenientMD! Touring the facility was such an eye-opener and good to put on our list above visits to the ER. Some faces were familiar and a pleasure to reconnect with. Several business opportunities presented themselves: a possible exhibit at a local theatre, as well as two requests for a donation of his artwork for worthy causes. All in all, a super start to our Chamber membership. I have to tell you, every single person at the Greater Concord Chamber of Commerce is incredible to work with – helpful, kind, creative, timely… We have the best Chamber ever. Great presentation this morning ("Putting the Chamber's Website to Work for You"). I have not been as active with the Chamber as I would like to be, and had no idea that you do so much! Chamber Connections is already paying dividends. Thanks again for including me! Sullivan Creative had been working in the area for nearly 10 years when we decided to close our Boston office after 24 years and pack up and move to Concord in 2011. We were fortunate to find a great space not too far from the Chamber's new offices on Main Street. I turned to the Chamber for advice about how to start getting connected with prospective clients. Kathy was awesome, and sat down with me and helped develop a plan. One of the key components was to advertise in their print newsletter [The Chamber Review]. We have been doing it for about six months and it has more than paid for itself. Thank you! The Greater Concord Chamber of Commerce is a beautiful facility with beautiful people to match. They really do a great job of making you feel like you're a member of their family, and they are willing to provide you with the resources and expert advice you need to make your business, brand, or advertising campaign succeed. The Greater Concord Chamber of Commerce is the epitome of dedication to members they serve while responding to current business needs and demands, all while maintaining the utmost professionalism. I would recommend membership to any business looking to improve exposure and network their organization. A good friend, Julie Poliquin of Davis & Towle Insurance, invited me to attend the Concord Chamber's Business After Hours on May 13th. What a warm reception! What an energetic, welcoming community of people eager to introduce themselves and ask about me and my business. Every chamber has its own character, and I'm very impressed with this one's. Julie said it's always like this - I look forward to continuing and deepening the connection. I am a proud member of the Greater Concord Chamber of Commerce. Being a member and an Ambassador of the Concord Chamber has been and continues to be a rewarding experience. The business we acquire from networking with the Chamber is immeasurable. The Chamber has a variety of ways that you can get involved - based on the time commitment that you can offer. I am thrilled to be involved with such a vibrant, connected, and quality organization. I just want to take a moment to let you know how much we enjoy being part of the Chamber community! We have met some wonderful people and have made some very fruitful connections. Thank you so much for your continuous effort. Our advertisement on the Chamber's website seems to be doing a whole lot of work for us-- thank you! We'll renew that ad for SURE, because we're getting a lot of bang for the buck on what we're doing. The Chamber is drawing some wonderful interest with all you have going on. We're very happy to see Concord so well represented on the web! 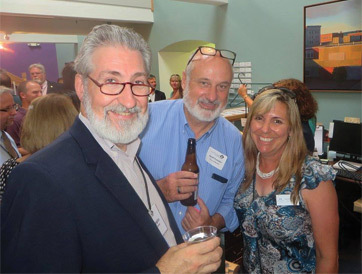 If all your Greater Concord Chamber of Commerce Business After Hours events are as popular as these we’ve had at PSU’s College of Graduate Studies last year and this – then you may have the most party-loving membership in America. I can’t remember a reception in my 48 years at The BALSAMS that had so many people reaching out their hands to say hello and eager to have a get-acquainted conversation. Your members are truly champion meet & greeters. We had a great time at the After Hours event. As new members we weren't sure what to expect, but we easily assimilated into the energetic - and large - crowd. The PSU Graduate School made for an excellent venue. My only regret is that I was too busy chatting and never had a chance to sample the hors d'oeuvres! Like so many of us, I plow through countless virtual and hard copy newsletters, white pages, magazines, and news sources every month, passing most of it with a glance. However, your Chamber newsletter is a local resource that catches me every month. I always find something helpful whether it is a local expert with good information, a promotion of an acquaintance, or a coming Chamber event. Through a dozen years in this wonderful community, the Chamber newsletter continues to be something I read every time it lands in the office. Thank you for your continued focus on being relevant to the business community. We are lucky to have such a solid Chamber. I thought that the website meeting was quite informative. It seemed like most people learned some things that they weren’t aware of. The website is a powerful marketing tool for businesses that know how to take advantage of it, so it is valuable information that you are providing. I thought that you both did a good job of presenting it. I wanted you to know that I found that the time I invested with the Chamber Connections group allowed me deeper connections to individuals and companies in the Chamber than I would have otherwise had. It is through those connections that trust and credibility are formed, which ultimately translate to growth for my business. I feel a greater sense of belonging and have been approached by some members to work together. I am honored to have been a part of the group. Are you a member of the Greater Concord Chamber of Commerce? We are! We love being a member and working with their team. If you aren't a member, consider joining today. The Concord Chamber of Commerce does it again…great event last night. I make some great new contacts, reconnected with existing partnerships and even enjoyed myself. Thanks again for all that you do. I can't ever recall having an unpleasant experience with either the Business Before Hours or Business After Hours events because everyone is so hospitable. Today's group at Loudon even bested that feeling 100 fold. The nicest folks yet. They know the meaning of hospitality, and they need to know that it didn't go unnoticed. The best chamber on the planet! I can't speak highly enough about my experience working with the Greater Concord Chamber of Commerce. The Chamber staff members are uniformly enthusiastic about their work, and have an obvious dedication to stimulating the area economy by educating and connecting its members. Furthermore, their educational and networking events are some of the best attended in the state, and this is no doubt due to the friendly and welcoming spirit that they have fostered. I am convinced that a membership in the Greater Concord Chamber is the best return on investment a business or nonprofit can make. On behalf of Northway Bank, I would like to thank you for the Chamber's support and hard work in making our VIP event a great success. I have been exposed to a number of chambers throughout the state and Concord always stands out as one of the best! Thanks for arranging the ribbon cutting with Mayor Bouley and all the things you do to make Concord a special place. In my profession, insight into what other people do and why they do it is a requirement for producing good work. Chamber Connections gave me a privileged view into businesses new to me and a chance to explain my own. I looked forward to the meetings as I look forward to continued relationships with the people that I met. 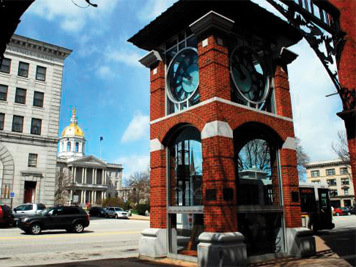 We’re thoroughly impressed with the Concord Chamber and all that you do. It’s great to be a member! I come across so many people I met at the Chamber meetings and it’s a wonderful network. You do such a great job for the community.